Red Bull and Renault has endured a very trying start to the 2015 season as the four Renault-powered cars suffered multiple engine failures.Max Verstappen was the first to take a penalty for a fifth power unit component as he was given a ten place grid drop in Canada. Red Bull’s Daniel Ricciardo is also under threat as his first penality is imminent. His team decided to survive the Canadian GP with his last engine and interestingly they are planning to take a grid drop in their own GP on the Red Bull Ring. The team explained the reason behind that. They expect the Hungaroring to be their best track of the year and therefore they might compromise the Austrian race in an attempt to have a relatively fresh engine in Hungary. "It will be probably our strongest track for the year," said team boss Christian Horner, "so it is important that we start as high up as possible." Horner expects the worst case scenario for the next weekend. "We must expect that we will be on the last row of the grid," he is quoted as saying. The senior figure of Red Bull’s driver programme, Helmuth Marko admitted that Red Bull were still not delighted with Renault’s work as the French power unit slipped further behind in terms of peak power compared to last year. 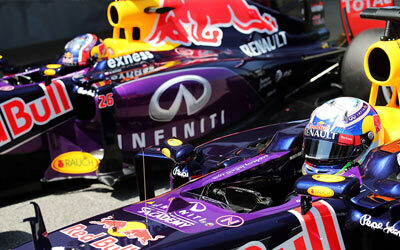 "In terms of the engine," said Dr Helmut Marko, "we are in a worse position even than last year. "The GPS comparisons on the straights are frightening," he is quoted by Auto Motor und Sport.